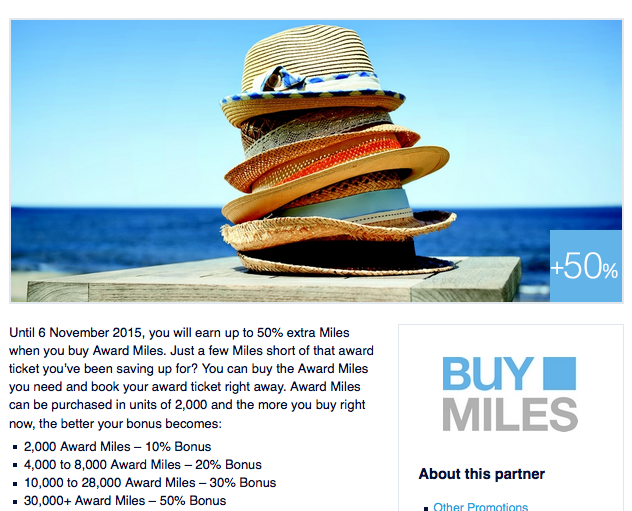 Air France KLM's Flying Blue is once again offering a bonus on buying their miles. Usually buying FB miles isn't a great proposition but if you can tie in buying them with one of their discounted promo awards offering up to 50% off award tickets you may just be able to out some value from this promotion. You can buy 96,000 miles for EUR 1760. Those 96,000 miles will be enough to redeem for a discounted business class award ticket between Montreal or Vancouver and Europe (with a few miles to spare). Looking at Jan 7-14, 2016 in business class you can get the discounted rate between YVR & CDG for 93,750 miles and C$719.84 in taxes and fees. To buy the miles will cost C$2680.59 (including 5% GST) and add in the taxes and fees on the award flight of C$719.84 for a total of C$3,400.43. To buy the same tickets outright costs C$4,825.30. As you can see buying the miles can provide you a savings of over C$1,400 on these particular flights! And remember the discount for these Flying Blue tickets is only 25% at this time, sometimes its 50% off so your savings could be even bigger!